Since there is no substitute for water, many gathered at the Two Rivers Convention Center to discuss current conditions of the river, and plans by western states on what to do to protect our water supplies. 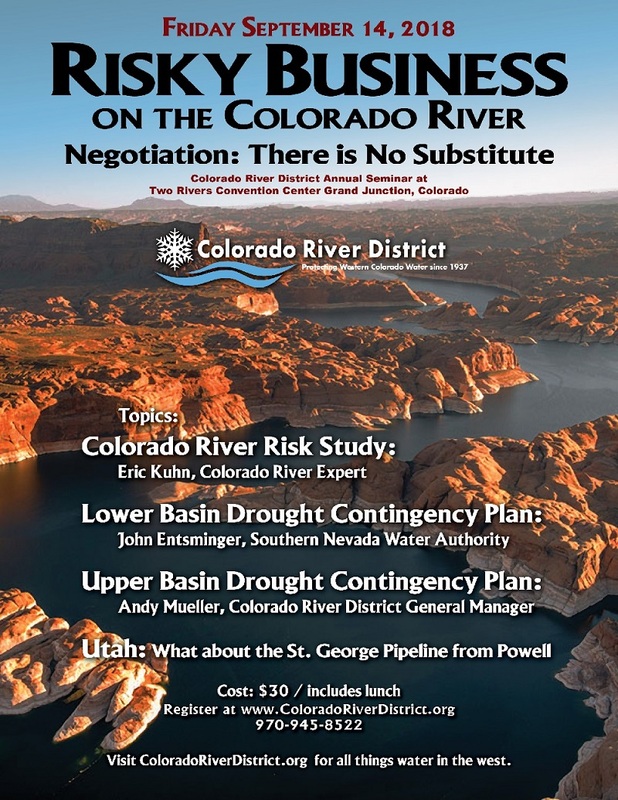 The Colorado River District held their 2018 Water Seminar focused on the Colorado River. They discussed handling the growing demand for water, how other states like Utah use the river, plans to combat drought, and climate change conditions. The seminar went over several studies including one that looked at how Lake Powell could be drained if the current drought continues and how that would impact Colorado. The general manager of the Colorado River District on Friday voiced strong criticism over what he fears is a lack of transparency when it comes to discussions over how to manage water in response to drought. Andy Mueller raised his concerns during a district water seminar in Grand Junction that focused on contingency planning measures aimed at responding to the potential of a continuation of a long-term drought within the river basin. Mueller specifically cited the district’s understanding that Colorado and other states may execute a series of documents as soon as the end of the month, including a demand-management plan for states in the Upper Colorado River Basin. “We have a very serious concern that we haven’t seen the demand-management document. We haven’t seen what it is our Upper Colorado River commissioner is potentially going to sign within the next month,” Mueller said. He worries that the result could be an agreement that is harmful to western Colorado water users, particularly in the agricultural sector. “We haven’t seen those documents that are about to be executed. We’ve been told that we don’t need to see them. We’re not OK with that. We don’t think it’s acceptable. We think those documents need to be shared with us and frankly the impact of those documents needs to be shared with the water users of the Western Slope and the state of Colorado,” he said. Colorado’s representative on the Upper Colorado River Commission is James Eklund, an attorney with family ties to the Collbran area and a former director of the Colorado Water Conservation Board. Reached for comment Friday, Eklund expressed surprise about Mueller’s concerns, and said the river district and other interested parties will have plenty of opportunity to provide input before things are finalized. “We are not in any way rushing to get something inked that he and the (river) district and the other advisers in the state on Colorado River issues don’t get a full chance to evaluate and look at and analyze,” he said. He also provided a different timeline than Mueller did, saying the goal is to get documents ready for review by interested parties by the end of this month, allowing for subsequent consultation with them, with a goal of wrapping up agreements by the end of the year. Mueller’s concerns arise over drought contingency planning to respond to falling water levels in Lake Powell. That reservoir is used by Upper Basin states to meet water-delivery obligations to Lower Basin states under a 1922 compact. The river district and other entities are looking at demand management as one means of trying to shore up water storage in Powell to avoid a compact call on Upper Basin holders of post-1922 water rights to meet downstream obligations. The river district supports the idea of a demand-management program, which could involve measures such as temporary fallowing of lands by agricultural producers, as long as the measures are voluntary and compensated, and the burdens of reducing demand are shared proportionally among all users. Mueller thinks some Front Range operators of transmountain diversions want to set up individual accounts within the pool of water created through demand-management efforts so that after a compact call occurs they can protect their own diversions while West Slope users get shut off. Mueller said the idea of mandatory curtailment of use has never been discussed by water roundtables around the state. “It’s one that needs to see the light of day and we need to understand it before the state signs those demand-management documents,” he said. Eklund sees such matters as intrastate issues to be resolved within the state of Colorado. His focus at the interstate level when it comes to the demand-management program is to reach an agreement under which conserved water can be stored in Powell in a separate account rather than just being subject to downstream release under existing agreements. Without such an agreement about where to put the water, he views the discussion about what constraints and sideboards such a program should have in Colorado as being meaningless. “I think our focus at the interstate level, my focus on behalf of the state of Colorado at that level, is on making sure that we have the table set for the discussion, so that it’s not just an academic, theoretical discussion,” he said. Mueller said the river district’s concern is that creating a place to put water for a demand-management program ahead of creating the program’s sideboards and rules could lead to wealthy, Front Range water interests using the pool “for very different purposes” than just avoiding a compact call. Click here to view the Twitter hash tag #crdseminar for all the real-time coverage from the seminar.